Accessory Value Package * Select Bronze Accessory Value Package (+$59.49) Silver Accessory Value Package (+$75.49) Gold Accessory Value Package (+$119.49) Platinum Accessory Value Package (+$149.49) No Thank You! Extended Warranty * Select Extended Warranty (+$249.00) No thank you! The 2017 Surrey Deluxe™ was designed with an appreciation of our past and an eye to the future. 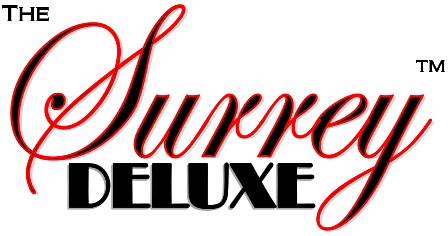 The result is the Surrey Deluxe™, unique in its design and style with no equal. Designed for three adults and two small children, the four wheel Surrey bike provides families and other sightseers with the ability to leisurely enjoy any park, boulevard, beach or lakefront. At home, a Surrey bike is perfect for families to enjoy their neighborhood, local city park and other areas suitable for bike riding. Now with the exclusive Easy 7 Speed Gearing System, this Surrey has not equal. This package includes the 7 speed system on the driver side only, which is popular among parents that will not have another adult riding with the children. Assembly required. Assembled units available for an extra charge. Call for details.